With her 'bird's nest' hair, Daisy Waterhouse has never been as pretty as her favourite pictures. But when that hair starts to fall out by the handful, she has no idea how difficult life will become. Starting afresh in a new town is hardenough without her dad. Her best friend is in Australia, and for Tamsin next-door, being seen with Daisy isn't good for a model girl's image. Baldness is hard to hide, and the school bully is on hand to make it impossible. It's only in her diary that she reveals her true feelings, but deep down Daisy knows there are only so many secrets she can keep. When she meets Flame the eco-activist, weekends by the Thames bring freedom and friendship along with surprises, headlines and new battles to fight. With unexpected help - from George, an off-the-wall loner, and a stranded baby whale - Daisy is determined to hold her head high. But it takes a lot more courage than she could ever have imagined. The Waterhouse girl is an inspiring novel about how we treat one another and the planet, about hope, acceptance, and commitment. It's a story for our times. Sue Hampton is an ex-teacher who has a love of music, art, dance, flowers and the natural world find expression in all her stories. Sue believes in the power of words and ideas and hopes her books will make readers think and feel. Sue enjoys visiting schools and libraries to inspire young people to read and write good stories. Sue Hampton: Sir John Waterhouse was a Victorian artist who always painted the same gorgeous girl, and the most striking thing about her is her fabulous hair. As a teenager with troublesome frizzy hair I thought they were very romantic, like Daisy does in the book. So there's an irony in the surname when she loses all her own hair. Can you tell us a bit about alopecia and the symptoms? Sue Hampton: Like Daisy I noticed lots of hair in my hairbrush. One day I realised I could feel bald patches hidden underneath longish hair. Four months later it had all fallen out, some of it in the shower. There are no other symptoms. I didn't feel stressed - until I started losing the hair! Twenty-eight years ago I was given anti-depressants, because of the association with stress, but didn't take them. Now I think alopecia is more often seen as an auto-immune condition, meaning that the immune system rejects the hair. I've also heard that there can be statistical links with eczema, asthma and thyroid conditions - all of which I do have. Is there anything that can slow the process of alopecia? What treatment is there? Sue Hampton: There wasn't for me, but that was a long time ago. I had many alternative treatments - everything available - and a dermatological lotion from the doctor. I know of a little girl whose alopecia was caused by a cream she was using for eczema. When she stopped using it, her hair grew back. That may be an unusual case. For me, there hasn't been a solution. Do you think it would be harder to loose your hair from alopecia when you are younger or older? Sue Hampton: There's an argument that children have developed less tact and in some cases, empathy, so their response to another child with alopecia can be cruel, or insensitive. Adults should have learned some manners - but a man in the street called me an alien! For a woman of twenty-five like I was, there are different social pressures. We know we can be judged by our appearance and the rules about how we look are very deeply embedded in our culture. A young child will be less aware of those, and in any case, what's hardest is to feel different. All my novels carry the message that being different is okay. Be an individual. Be yourself. Celebrate difference and don't be a clone. What research went into writing The Waterhouse Girl from a younger girl's point of view? Sue Hampton: I used to be a teacher so I've spent a huge part of my life with children and young people. They have always amazed me with their depth and insight, which a lot of adults underestimate. I enjoy and respect them and I think I've stayed in touch with the child in me. How long did it take before you could remove your wig around family and friends? Sue Hampton: I have two children and felt they must see me from birth without my wig, so that it didn't shock or distress them. It was many years before I allowed my closest friends to see me bareheaded, and twenty-eight years before I walked out of my own front door leaving the wig on its stand! How did you deal with the fact that your hair was falling out? Sue Hampton: I tried to stay calm (not very successfully) because I thought anxiety and tears would make the problem worse. Even after I'd lost it all I told myself it would come back; it sometimes does. I went and bought an off the peg acrylic wig but I hated it because it was too old for a young woman, too shiny, and very hot and itchy. Then one break time in the playground it blew off! Later on I discovered some wonderful real hair wigs that looked natural, but cost a lot of money. The problem was that I was hiding or pretending, which made me vulnerable because of the fear of discovery. There are also practical difficulties - swimming is impossible, and exercise that makes you sweat has to be avoided because washing the wig shortens its life. Daisy chooses not to bother, and I wish now that I'd done the same all these years. But emotionally I couldn't. I couldn't consider it or imagine that it would ever happen. My self-esteem was too low. Do you have any recommendations for other females who are diagnosed with alopecia? Sue Hampton: I hesitate because we all have different lives, personalities and circumstances. Recent changes in my life have made it possible for me to abandon my wig and take the attitude that if anyone has a problem with the way I look; it's their problem, not mine. But it took me a long time to be as brave as Daisy. Whether to wear a wig or not is a personal choice. I think the important part is not to feel diminished, to hold on to your true self, the part of you that has no connection with the outer shell people see. That's what Daisy does. 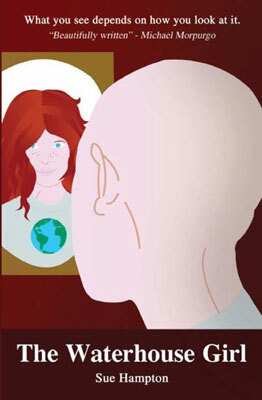 And she sees beyond her own alopecia, is an eco-activist and a generous human being who empathises with others. It has been suggested that alopecia is hereditary had anyone else in your family had alopecia? Sue Hampton: My grandfather had alopecia areata - bald patches once or twice in his life. He didn't lose all his hair. I think that heredity plays a part in many conditions, alopecia included, but that doesn't mean there's anything inevitable about it. The reason I gave alopecia to Daisy and her mum in my book is that it's an emotional rather than a medical truth, in the sense that my own mum wished it had happened to her, not me, and I've met a dad who said he felt exactly the same. Parents would take their children's burdens if they could. Am I Worried, or is this Anxiety?